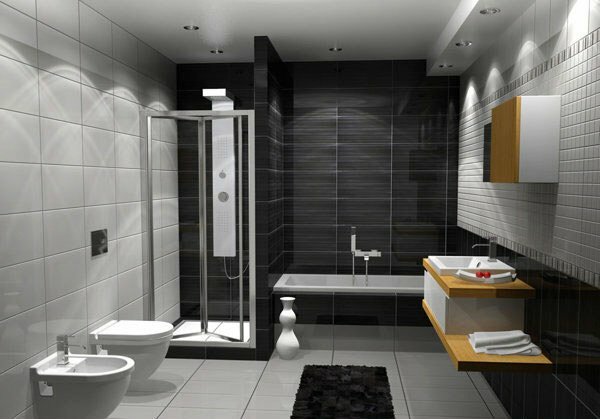 When choosing the best bathroom tiles designs we have a lot of options to consider. It depends of course on the type of bathrooms that we have. We may have an eclectic, traditional, contemporary or romantic bathroom in our house. 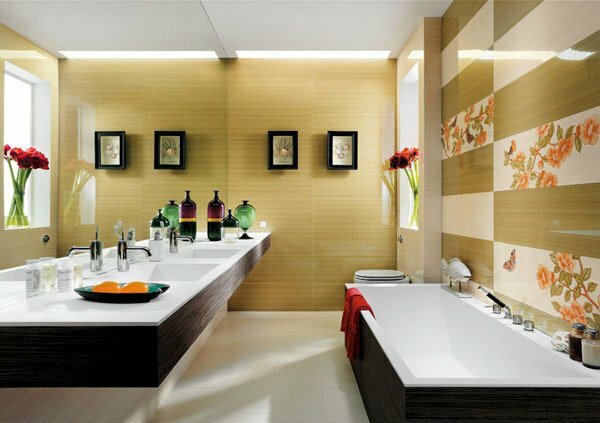 So we may also need to be careful in choosing bathroom tiles that will best suit in our design and taste as well. Certainly these designs will not just be pleasing in our eyes but also will capture the eyes of the visitors or guests and the members of the family. 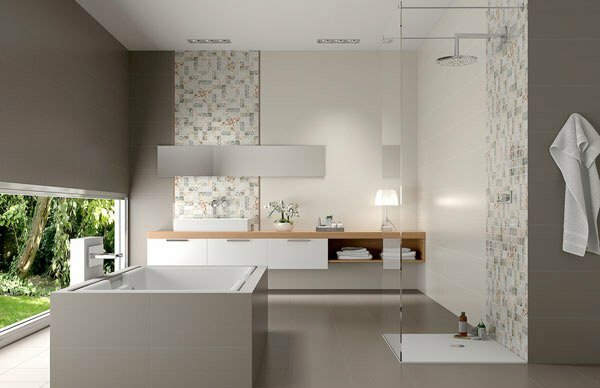 There are many different types of bathroom tiles that are already available in the market such as ceramics, porcelain and exotics or natural stone. These types of tile designs are widely used by the designers in the modern bathroom designs. 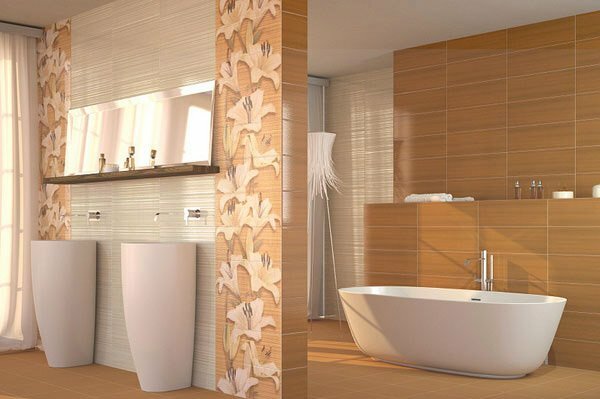 With that, there are several positive effects of this said tiles designs in the environment of our bathroom. These might create a more natural, airy and blooming appearance. For instance, the porcelain tiles are fairly limited in design compared to ceramics and natural stone. Moreover, when it comes to natural stone it is said to be extremely sensitive to moisture, but ceramic tiles are usually used for flooring because of its durability. But of course we must not forget to consider the size of the tiles that we may apply. 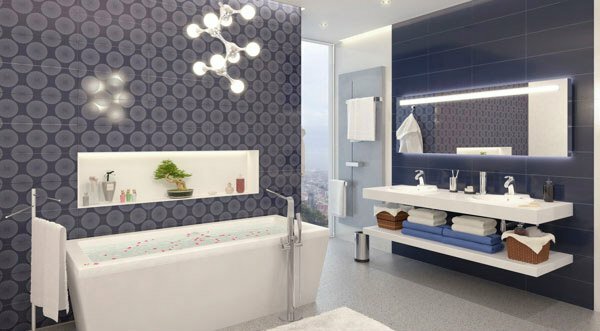 Some designers and homeowners choose the floral accents and pattern tile ideas to recreate the theme of their bathroom. 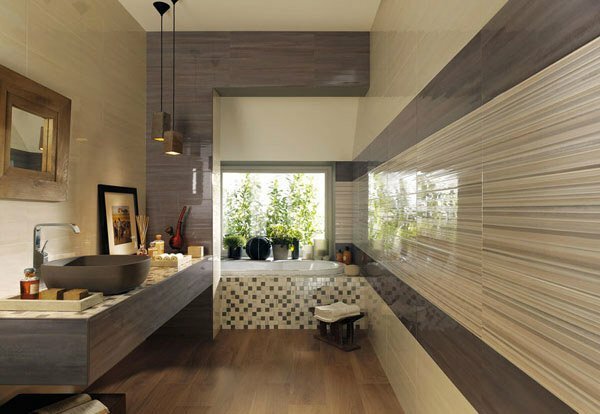 Now let us check the different kinds of bathroom tile designs that were already applied by known designs below. 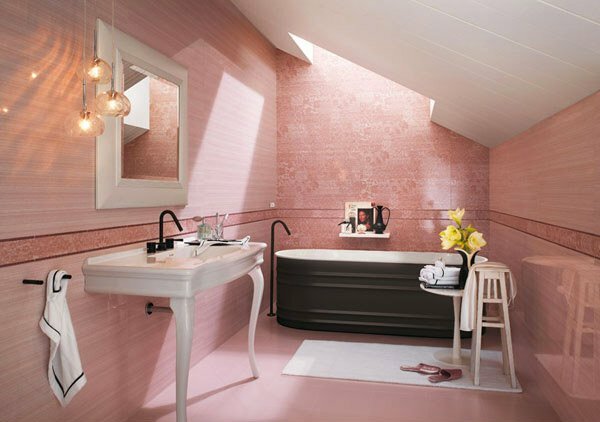 Using carnation pink for the walls and floor perfectly match with the simple lights installed near the mirror. With an amazing combination of black and white color of the walls and floor, the golden mirror stands out here and makes this space luxurious. The huge floral pattern placed in the sides of these two wash basin is perfect to break the plain appearance of the walls. 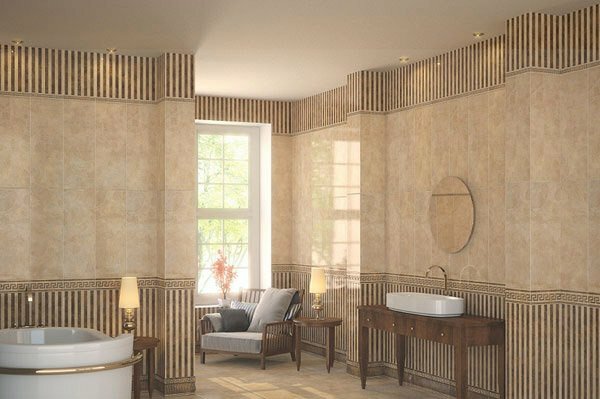 The stripe tile design in the wall creates a wide space effect on this bathroom as it shows the lines here. The lavander bathroom may surely provide a different comfort and the selected color theme here shows peacefulness. 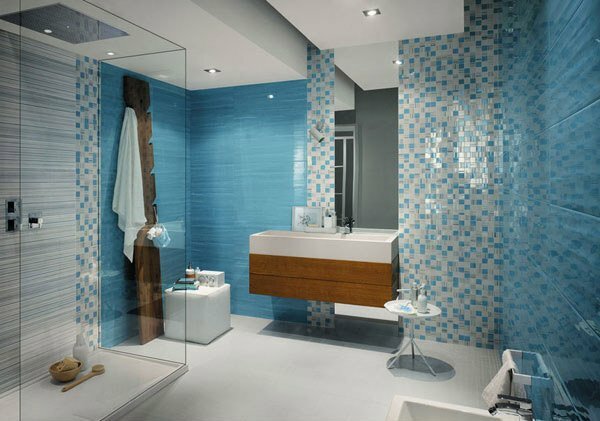 The mosaic tiles design combined with these sky blue colors will possibly make this bathroom cool and relaxing to stay in. 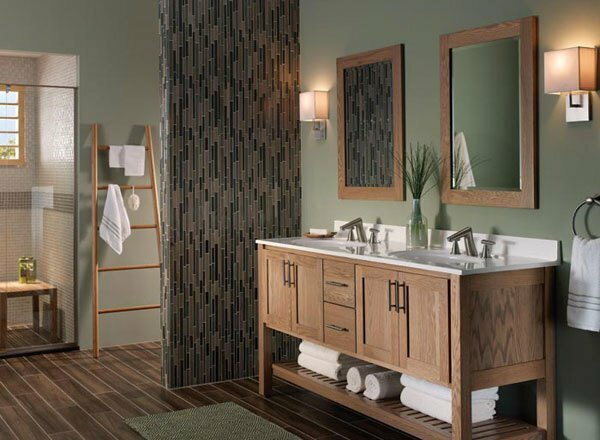 The mosaic tiles pattern used in the wall of this wooden and porcelain tiles bathroom is effective to show a more traditional look. The lights and the high quality fixtures used here is enough to make the homeowners enjoy while refreshing after work. The round pattern theme in this bathroom jives with the white and silver fixture that makes this look so clean and neat. 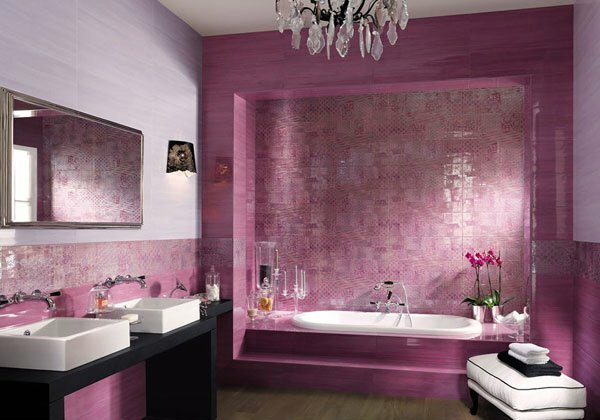 Just one look on the walls and mosaic pattern tiles applied here by the designer is enough to partner with plain pink tiles. The incredible lightings used in this area make this bathroom elegant despite of the black and white tiles used here. 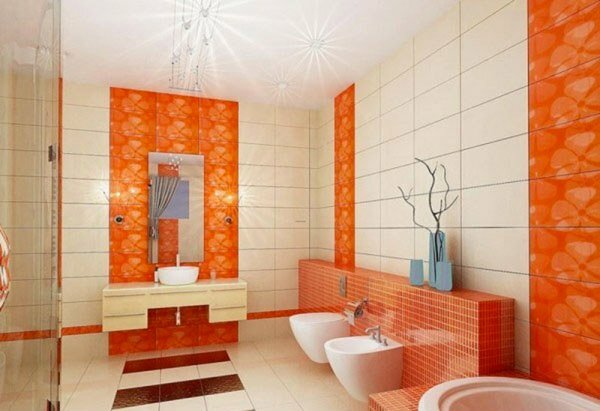 The orange accent tile pattern used here creates a livelier and bright look as the client may spend more time to stay here. The natural light that comes in the window gives the best opportunity for the client to feel the different texture it shows on its walls. 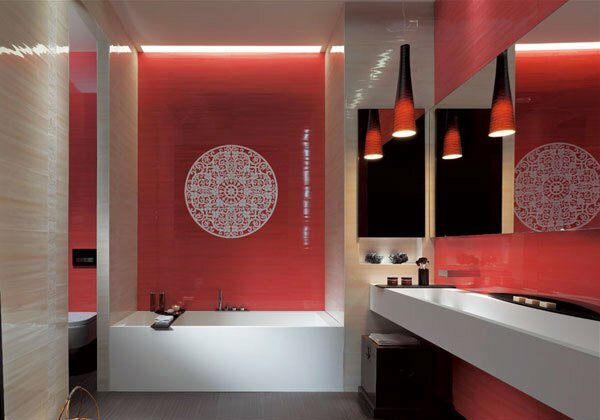 The unique lamps in the powder area as well as the round wall art in the center of red tiles in the walls are enough to display a more artistic bathroom design. The design of this bathroom may be simple but it is enough to let the homeowner feel how lucky they are to have a bathroom theme like this. The traditional design of this bathroom is emphasized through its lamp installed on each side of this was basin. Here is the master bathroom showing the openness of the place because of the glass materials used here. Let’s take a look at the flower tiles design alternately applied in right side part of this wall. This is the typical large bathroom set in a more natural concept design that shows the contemporary concept used by the designer. 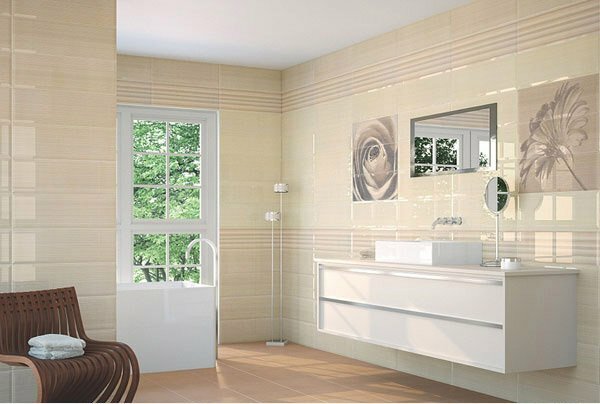 Finally, this classical theme bathroom highlighted the striped tiles design here as it welcomes the bright sun on its windows. As we have seen the different kinds of tile designs above we may say that they were really able to display elegance and art. The pattern shapes, size and colour of the tile you may use will really be advantageous to the overall appearance of your own bathroom. That’s why homeowners must think of ideas when they plan to change the look of their bathroom. 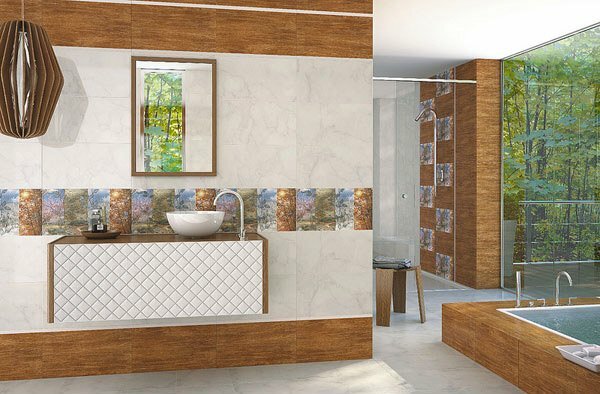 Thus we can say that in selecting the tiles design of your bathroom opens the possibilities.So we are hoping that once again we were able to inspire you with elegant and luxurious looking bathroom tiles designs above. And who will not say that choosing the best tile designs for your bathroom floors or walls is not a great challenge? You can check on some mosaic tiled bathrooms for inspiration. I love custom hand 3D carved stone tiles and traditional tile murals for Kitchens, bathrooms, entry, pool ect.